Unlike other materials, scrap metal is infinitely recyclable. The industry is growing and the benefits are second to none. 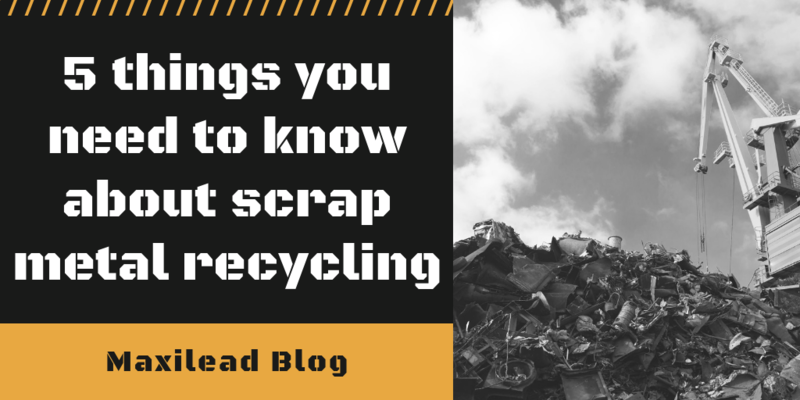 You probably already know that recycling is incredibly important, but how much do you know about the scrap metal industry? Here’s some insight. The UK has over 1,500 scrap yards nationwide and the industry is worth over £5bn per year. Recycled metals include end of life vehicles, Waste Electrical and Electronic Equipment (WEEE), aerosols and many others. This is taken from both residential homeowners and commercial businesses looking to recycling their scrap metal on a regular basis. For example, around 600 million aerosols are used each year in the UK, with 65% of aerosols being made from tin-plated steel. This equates to 30,000 tons of recyclable metal on an annual basis from aerosols alone. Once all these activities have been completed the processed scrap metal is prepared for export. Maxilead regularly ship scrap metal internationally to other countries looking to purchase in bulk. We have over 30 years of experience in exporting scrap metal to international partners located all over the world. Destinations include Europe, the Middle East, Southeast Asia and America to name a few, where we export over 5,000 tonnes of scrap metal per year. To find out more about how we export scrap metal, read up on our process here. Since the Scrap Metal Dealers Act 2013 there has been a tightening of regulations in the scrap metal recycling industry. This has ensured that those looking to sell their scrap metal are not being conned due to inexperience and scrap metal dealers are also not allowed to pay for scrap with cash, meaning all purchases can be monitored. Dealers also have to apply for a scrap metal dealer licence. If at any point they are found in breach of the stringent rules laid out, they can have their licence revoked. Since 2012 it has become illegal to sell your scrap without first providing us with a valid photo ID. (However, if you’re a Maxilead member, you’ll only have to bring your membership card). This step further reinforces the security of the scrap metal trade. These stats alone show how much of an impact is made by simply reusing metal by recycling it. Maxilead Metals is just one of the UK’s leading scrap facilities specialising in metal collection, skip services, WEEE, metal analysis and vehicle recycling. At Maxilead we have over 30 years of industry experience in processing and exporting scrap metal to partners all over the world. Get in touch with Maxilead today to find out more about scrap metal recycling and how we can help you. ← How are scrap metal prices calculated?